A friend of mine at work recently asked me an interesting question. He’s here in the US temporarily on a “global exchange program” and was wondering how to start building his credit so that he could eventually take out a car loan, buy a condo, or just get a credit card with some points. It was an interesting question because I had always taken my credit history for granted. For as long as I can remember I have received credit card offers in the mail… from banks and lending institutions just waiting to give me credit. And my first credit card – a student credit card with a limit of $500 – was my first step at establishing credit. One solution to this “credit paradox” is to apply for a secured credit card. Secured credit cards work just like normal credit cards but require a deposit – usually between $99 and $500 – to protect against you skipping town without paying the bill. Most cards come with an annual fee for the “convenience,” but the fees are getting lower and are a small price to pay. There are a few things that you can do to establish good credit and avoid being scammed. 1. Shop Around: Look for a card that doesn’t charge an application fee. 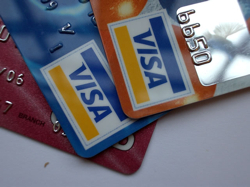 Although most cards charge an annual fee, the cards and their terms vary dramatically. Be sure to read the fine print. Some people have gotten secured cards and found their entire limit consumed with fees before they ever used the card. One place to start shopping is the list of secured credit cards at Bankrate.com. 2. Be Aware: As mentioned above, there are some institutions that treat their customers like cattle. Be aware of the bogus fees such as “insurance polices” or “convenience fees.” You should only be paying a reasonable annual fee. 3. Report Your Good Credit Activities: The entire purpose of obtaining a secured credit card is to build credit. You don’t need to purchase a lot, but make a few small purchases on your new credit card and pay your balance in full and on time. Secured cards carry a higher interest rate than most, so be sure to make small purchases that you can afford to pay off on time. But be sure to ask the credit card issuer to flag your good behavior to the credit bureaus as a secured card. If your good behavior isn’t reported, it defeats the purpose of the card. 4. Be Patient: You might not want to hear this one, but it is going to take time to build up that credit score. After about a year of making on-time payments, your credit card issuer will most likely want to keep you as a customer and should be willing to give you an unsecured credit card. Just ask. But if they refuse, try applying to a different lender or even the bank where your personal accounts are held. With a clean credit history, most banks would jump at the chance to get your business. Secured credit cards can be a credit lifesaver… as long as you’re smart when shopping for one and use it wisely. And hopefully by starting with a secured card you can develop good credit card habits that you can use later with an unsecured card. Thank you very much, this information is very useful, I haven’t been able to find it anywhere else. A good idea would be to try to avoid the unsolicited offers that just arrive by the dozen in the mail. Avoid any credit card offers by email as well. Wow! Nice article, I have got very good information about the credit cards here. It is very useful for modern life. The tips you’ve mentioned are really effective. Hope to see more posts like these. Improving a credit is a hard process, really. So even if you needn’t to get a credit card today, apply for a secured plastic anyway. It will help you to build your credit history step by step.